Something I’m pondering today is the fact that TIME is valuable. Recently I have had some encounters that are having me inquire into the whole topic once again. Years ago I explored the topic. At first, I found myself making people wrong for not being their word and keeping their commitment as they promised. It didn’t feel right, but I couldn’t put my finger on what was really going on and how I could be able to make a difference for myself. I came to the conclusion that many people don’t have a great relationship to their word. It’s not a bad thing; it’s just not workable. And I could go through life pissed off that they weren’t keeping their word to me and cut them out of my life. Or I could take a chill pill and realize that ultimately; I just need them to accomplish the task. Focus on the end result and what needs to be accomplished and not the process to get the result. Everyone has their own way of working in the world and who am I to impose that they should be their word. It just produces a particular result. Life ticks along and boom this topic has come up again. Each morning, I have accountability calls scheduled with people I’m mentoring. I want to support them in what they are out to achieve in the world and have been most accommodating with the time slots. I allowed them to choose what would work for them. It has taken some adjusting on my part, because my regular routine has been significantly changed and seems a little disjointed i.e. when do I get a big enough gap for a shower? Meditation? Workouts? My own business? I put these calls on my calendar and don’t schedule anything else around them. Invariably, I find that some participants don’t make the calls or they call late. Up to this point, I have been forgiving and polite. I guess the biggest conflict is when I really need to do something and I bump up against, “oh I have to wait until after the call I have in a few minutes”. I wait around for the call and then they don’t show. Now I have wasted my time when, if I had known that they weren’t going to be on the call I could have done what I needed to do. Often the next day, when I ask them about missing the call, they will tell me that they were on the phone with a client, like that is enough to smooth it all over. The reality is that they are saying that, them talking to their client is more important than talking to me. They may not couch it that way to themselves, because they have judgments and assessments about what that behavior means, but that is what it boils down to. This comes back to the point from my earlier inquiry when I decided to give up a commitment for what I thought was the bigger picture, the end result. Sure I’m thrilled that they are making the calls, doing the things it takes to make their business work. What I have to get them to understand now is that we have to set boundaries for ourselves. Sometime we are so excited about what is happening in the moment that we forget we have prior commitments and there IS a way to have it ALL work. In the future, they could chose to say to their prospect, “I have thoroughly enjoyed connecting with you and I want to complete our conversation. I have another commitment that I need to take care of. Can I call you back in 20 minutes or at a specified time?” Some people with a scarcity mentality might think that this is losing their opportunity to talk with this person; they may never get a chance to connect with them again. It was their one shot. Really????? But on the flip side, by honoring your commitment and honoring your word, you are sending yourself, your prospect and the universe a powerful message that you are leading a life by your design. You get to say how it is going to go. That is powerful and you will be surprised what opportunities come your way acting from this place. I personally have a choice here as well; I can be upset and complain about the fact that they don’t keep their word. That doesn’t really work for who I am and doesn’t get anyone anywhere. I could have a conversation with them and create new agreements that work for us both. I could also use this as an opportunity to make a difference for them by explaining cause and effect. We could talk about honoring people’s time by communicating prior to a commitment. Or I can find someone else that respects my time. This might make sense if all other options haven’t worked. I have to decide what my boundaries are and what is being true to who I am because I ,too, get to create a life by my design. To put this another way, I recently had a call from someone trying to sell me something. She spent a good length of time (the call was scheduled for 30 minutes and she went on for 45minutes) talking with me and telling me how this would be great for me. Probably not the best sells technique. Had she spent that time actually giving me information (creating value) that would make a difference for my business, it would have been a more productive use of her time. We won’t go too far into this as it is better for another time. At the end of the call, she scheduled a time to follow up with me after I did some thinking and research. She was obviously late to her next scheduled call and didn’t close my sale. When the day and time arrives for the follow up call, again I am up against honoring my commitment to be on a call with this person or completing a task that could move my business forward. I decided that it was more important that I be my word and be on the call. I waited around answering email and such for 15 minutes and decided that, OKAY she’s not calling. 15 minutes is a long time to be late. I went to work on my other task for my business. About 5 minutes into my call with my client, the woman beeps through on my phone. Of course, I did not take it at this point, that would not have been honoring my client’s time, but when I completed the call I listened to her voicemail. She had a long-winded explanation that one of her other sales calls had gone way over (like the one she had with me) and that she was hoping that she could still catch up with me. Her number was blocked and she didn’t leave a time to reschedule and she never called back. It is interesting though to look at people that are constantly late and have a really good reason for it, and how that begins to show up as who they are. People start to say, “Oh that person is so busy. Bless her heart.” I wonder if that person consciously chose to show up that way or if it just happened and they bought into it. Now they themselves believe that they are just “so busy” and at the whim of their schedule with no control. One of the things that I have learned through this whole inquiry is that we always make time for the things that are really important to us. Is it important to you to make the sale, or be right about needing to be on time? 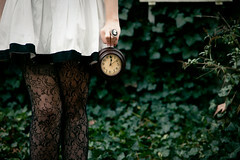 Is it important to you that you value someone’s time and value your own time? Is it important to you how you show up in the world? Is it important that you have clear boundaries and chose how your life goes? Only you can answer these questions for yourself. Be true to yourself whatever it is. On one last note, I want to make sure that if you find yourself controlled by your circumstances or see yourself as someone that has not honored someone else’s time, Don’t beat yourself up! All there is to do is be aware that is what was running the show. Awareness is the first step to making a difference for yourself. Clean up anything with anyone that you need to. It is amazing what being in communication and authentically sharing yourself can do for a relationship. And then powerfully chose something different. Chose the life you want. It’s all a journey. There is no arrival. Only more and more layers to uncover and explore. Joy.